Porsche again blocked out the top two positions in final free practice ahead of Friday afternoon's qualifying session for the Austin World Endurance Championship round. 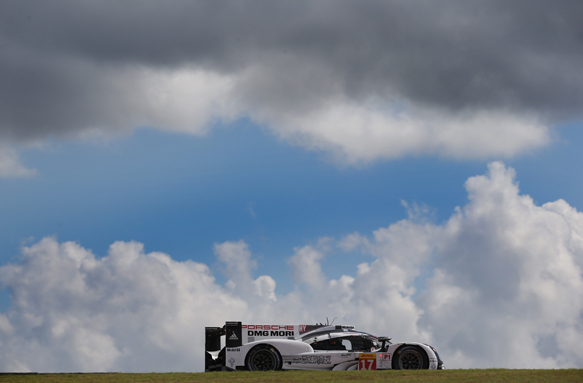 Brendon Hartley went fastest in the 60-minute session with a 1m46.435s, which put him three tenths up on the sister Porsche 919 Hybrid in which Neel Jani set a 1m46.781s. Audi, which had split the Porsches in the second session, took third position with a 1m47.436s from Loic Duval. That was seven tenths quicker than the second R18 e-tron quattro, which ended up fourth with Andre Lotterer's 1m48.207s. The Toyota TS040 HYBRIDs again ended up fifth and sixth in the hands of Mike Conway and Sebastien Buemi, with times more than two-and-a-half seconds off the pace. The Signatech Alpine squad was fastest in the LMP2 division with its ORECA-Nissan 03R. Paul-Loup Chatin's best time of 1m56.178s put him half a tenth up on Nicolas Lapierre in the KCMG ORECA-Nissan 05. Porsche led the way in GTE Pro with Patrick Pilet. His session best of 2m05.134s aboard his Manthey-run 911 RSR was two tenths quicker than a late lap from Gianmaria Bruni in the best of the AF Corse Ferrari 458 Italias. GTE Am was led by Aston Martin Racing driver Pedro Lamy.